Author Marlene Burling’s newly released “A Daily Walk with God” is a book of devotionals that offers encouragement and reminds readers of the comforting presence of God. “A Daily Walk with God” from Christian Faith Publishing author Marlene Burling is a collection of daily devotionals inspired by the author’s personal healing and grieving process. “A Daily Walk with God”: a product of a cathartic personal exercise after the death the author’s husband. “A Daily Walk with God” is the creation of published author, Marlene Burling, who was married to J. Autry, a pastor, for 51 years. The author currently maintains a weekly blog. Published by Christian Faith Publishing, Marlene Burling’s new book is designed to pass on to readers the spiritual lessons that can be found in life’s ordinary everyday happenings. View a synopsis of “A Daily Walk with God” on YouTube. Consumers can purchase“A Daily Walk with God” at traditional brick & mortar bookstores, or online at Amazon.com, Apple iTunes store, Kobo or Barnes and Noble. 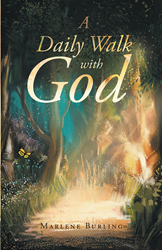 For additional information or inquiries about “A Daily Walk with God”, contact the Christian Faith Publishing media department at 866-554-0919.